The National Football League and Maroon 5 are facing fresh controversy after the league announced that the Super Bowl headliners would not be taking questions from reporters during the traditional pre-halftime show press conference, which has been canceled. "As it is about music, the artists will let their show do the talking as they prepare to take the stage this Sunday," the NFL said in a statement Tuesday. "Starting with the Pepsi Super Bowl LIII Halftime Show announcement, we began a cross-platform rollout of behind-the-scenes footage and content from each of the halftime performers. Instead of hosting a press conference, this social and digital media rollout will continue through Sunday across our owned and operated media assets as well as through the platforms of the artists." "Entertainment Tonight" announced Wednesday that lead singer Adam Levine will sit down with the outlet for an interview on Thursday in Atlanta, where the Los Angeles Rams and the New England Patriots are set to face off on Sunday. The decision to cancel the press conference came after months of backlash against this years' halftime performers — Maroon 5, hip-hop artist Travis Scott and Outkast's Big Boi. The artists have been criticized for agreeing to perform amid boycotts and protests against the league's treatment of former San Francisco 49ers quarterback Colin Kaepernick, who was the first to take a knee on the field during the playing of the national anthem in 2016 to protest racism and police brutality. Kaepernick has not been re-signed by another NFL team for more than two years, and critics say that Maroon 5 and the NFL are dodging some tough questions. 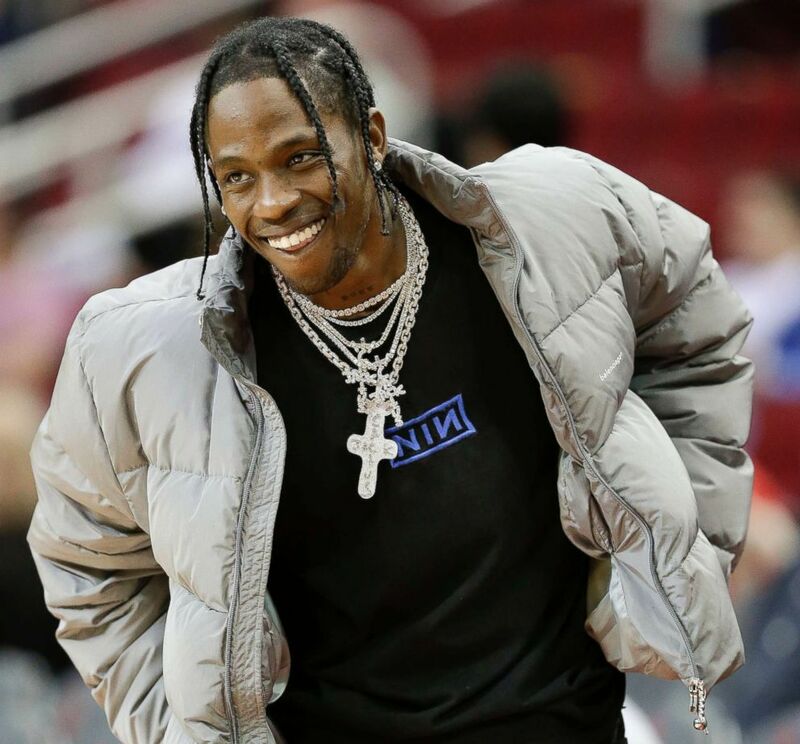 Hip hop artist Travis Scott watches warmups before an NBA basketball game between the Houston Rockets and the Denver Nuggets, in Houston, Feb. 9, 2018. Kaepernick filed a grievance against league owners last year alleging that they colluded to ensure that he remains unsigned. To many, he has become a symbol of the modern civil rights movement and a pariah among some conservatives who accuse him of being unpatriotic. When asked about Kaepernick during a press conference on Wednesday, NFL Commissioner Roger Goodell told reporters that teams "do whatever they can to win" and make decisions about players individually. "Our clubs are the ones that make decisions on players that they want to have on their roster," he added. "They make that individually, they make that in the best interests of their team and that's something that we, as the NFL, take pride in." Maroon 5 and Interscope Records did not immediately return ABC News' request for comment Wednesday. Over the past few years, the NFL and the Super Bowl have been thrust into political and social debates. The national anthem protests were magnified by other athletes who spoke out and by President Donald Trump, who has ignited an ongoing feud with the NFL. Trump has decisively opposed Kaepernick and other players who followed in his footsteps and has kept the issue at the forefront of the national conversation by repeatedly bringing it up on Twitter, at rallies and while talking with reporters. The debate has prompted boycotts of NFL games from both sides over the past two seasons and Super Bowl performers have also been caught in the crossfire. On Tuesday, Maroon 5 announced that the band, along with the NFL and Interscope Records, will make a $500,000 donation to mentoring organization Big Brothers Big Sisters of America. "Playing the Super Bowl has been a dream of our band for a long time," lead singer Adam Levine said in a statement to E! News. "We thank the NFL for the opportunity and also to them, along with Interscope Records, for making this donation to Big Brothers Big Sisters, which will have a major impact for children across the country." Amid criticism from fans, Scott, the hip hop artist, told Billboard earlier this month in a statement that he agreed to perform at the Super Bowl because the NFL agreed to partner with him to donate $500,000 to social justice organization Dream Corps. "I back anyone who takes a stand for what they believe in," Travis said in a statement. "I know being an artist that it’s in my power to inspire. So before confirming the Super Bowl Halftime performance, I made sure to partner with the NFL on this important donation. I am proud to support Dream Corps and the work they do that will hopefully inspire and promote change." Like the national anthem protests themselves, the controversy over the Super Bowl halftime show has gone on for years. 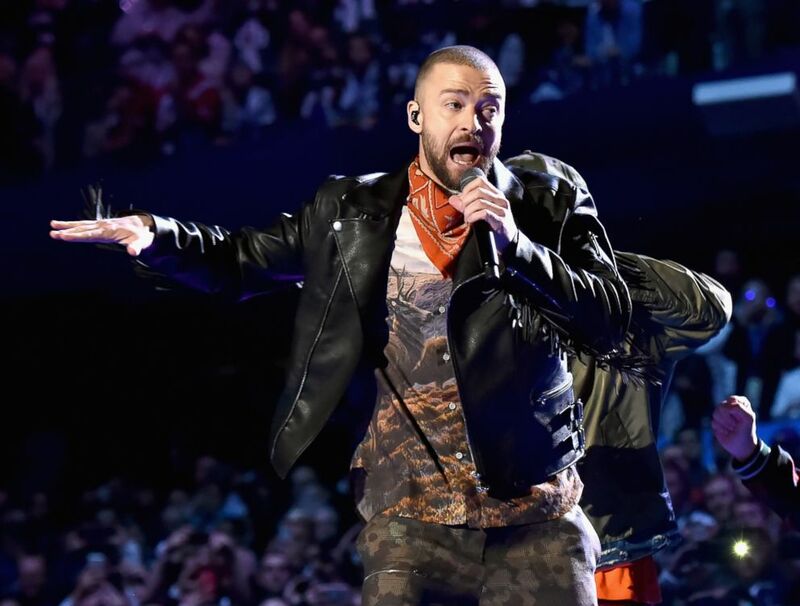 Justin Timberlake, who performed last year, also faced some backlash. Recording artist Justin Timberlake performs onstage during the Pepsi Super Bowl LII Halftime Show at U.S. Bank Stadium on Feb. 4, 2018 in Minneapolis. Singer Cardi B told TMZ last year that she would not perform at the Super Bowl halftime show until "they hire Kaepernick back." But she is appearing in a Super Bowl ad for Pepsi. All these football team owners talking and all lat but when is y'all going to hire Colin Kaepernick ??? But comedian Amy Schumer refused to appear in a Super Bowl ad, citing her support for Kaepernick. For its part, NFL launched the "Inspire Change" initiative earlier this month to support criminal justice reform, building relationships between police and the community, education and economic advancement.